but traveling with children is way different from traveling without them. The carefree jaunts through places unknown with little to no notice, luggage, and stress are things of the past, and that’s if you had the opportunity to do them before the kids arrived. If you did, great. Make sure to keep those pictures safe. If you didn’t, just tell yourself that you didn’t miss much, and travel with kids will be much better. Although children may change the way you travel, they shouldn’t prevent you from traveling. Sure they come with a whole gang of special circumstances, extra planning and off the wall questions, but you’ll get used it. And once you do, you’ll love it. What’s The Best Age To Start Traveling With Children? 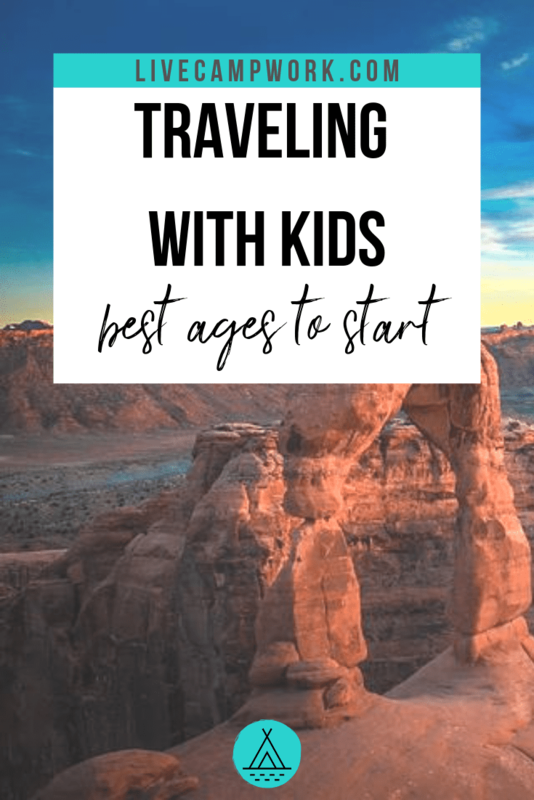 If you’re reading this post, it’s most likely because you have children and you want to know what is the best age to start traveling together. This is a really tricky topic. Because while it’s definitely possible to travel with children of all ages, each will come with a full set of both pros and cons. I won’t attempt to sell you on one age or another, because whatever age your children are, personally, I think it’s a perfect age. So I’ll just give you some useful information on each age group and let you decide for yourself. Traveling with babies can be easy and carefree, or the complete opposite. A child who enjoys the motion of travel will likely be a complete joy, as they may sleep for most of the trip and be pleasant for the rest. Nursing mothers will have a much easier travel life at this stage, as they won’t have the extra planning and prep that formulas and bottle feeding will include. Extra luggage for clothing, diapers, bibs, blankets and more can also be more stressful. Babies at this age are no longer sleeping bundles of joy. They’re active and mobile, and they want to be in everything. Exploring his or her surroundings is fun and exciting, but requires nonstop attention from parents, especially those in new and unfamiliar surroundings. Attention spans, at this age, are usually quite short but lucky for you, it doesn’t take much to entertain them. Repetition and structure, as much as I hate to admit it, will be your best friends. Having designated meal times, bedtimes and most importantly naptimes will keep your baby travels from spiraling out of your control. just found their independence takes guts and lots of patience. Pack extra and you’ll be just fine. Foreseeing mood changes and energy levels can make travels more smooth. Prepare for extra breaks, to allow stretching, potty breaks and maybe some regrouping. Keep tantrums and boredom at bay, by having a secret arsenal of new books, toys and snacks. Little adventurers are bursting with questions, at this age in travel. They’ll keep themselves and you busy with wanting to know all out the who, what, when, where, why and how behind your trip? Instead of being short with answers, make an increased effort to answer their questions in as much detail as they can handle. Keep the trip exciting by giving them the information they seek. Sight word, I Spy and other fun travel entertainment are great things to keep on hand for moments when the kids get restless and Dad isn’t ready to make a stop! Now is the time when travel turns from exciting to amazing. Kids are maturing and as much as they want to have fun, they also want to explore. As you travel you’ll notice the kids taking the lead. You may have planned the trip, but they’ll make it their own with personal observations. Social skills are sharpening, and they’ll enjoy meeting new people, group interacts and even kid’s clubs. Keeping a travel journal at this age will prove to keep children engaged and entertained. Traveling with teens will be just as turbulent as being at home with them. Highs and low are bound to happen but keep positive and they’re sure to pas quickly. Spark curiosity in your teens by encouraging them to do some self-guided explorations, or maybe a personal guide for the rest of the family. Giving them the control and authority to make a few smaller decisions about the family adventure just might cure a bad attitude or reluctant traveler. Regardless of what age you decide is right for your family to start traveling together, one thing will remain true… The more you travel, the easier it gets. As your family begins to get comfortable with traveling together, everyone will know what to expect and what is expected. So start soon and keep going, it’ll get better and better with each adventure you take! 70 RV Family Travel Blogs You Need to Know!